Tiger N Woods Resort is located in the Avarghani Village right amidst the dense forests of the park. Tiger N Woods Resort offer excellent accommodation and recreational facilities. Baghvan is an exclusive lodge located near the park. The Baghvan Lodge is managed by the Taj Group of Hotels and is one of the best when it comes to accommodation and recreational facilities. This Jungle Camp is the only 3-Star Resort in the park. 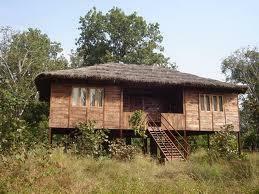 Located in the Pench National Forest, Jungle Camp offers exclusive accommodation facilities amidst lush green forests. Please do confirm the charges before planning the trip as they are subject to change. This National Park is located within the Seoni and Chindwara Districts towards the Southern Side of Madhya Pradesh. Due to its proximity to various cities like Nagpur in Maharashtra and Jabalpur, This Park forms an ideal tourist place to be visited in Madhya Pradesh. The nearest airport for the Park is Nagpur in Maharashtra which is hardly 92 km away. The drive from Nagpur Airport to this park is hardly 2.5 hours which makes it really feasible. The other nearest airport within the Madhya Pradesh State in proximity to this Park is Jabalpur, around 206 km away. The drive from Jabalpur Airport to the park is around 4.5 hours, which makes it within reach. From Nagpur Airport and Jabalpur Airport, one can find private taxis and buses plying regularly to this park. The nearest rail road is Seoni around 30 km from here. Seoni is very well connected by means of trains with major cities like Mumbai and Jabalpur. The other nearest airport is Nagpur which falls on the Mumbai – Jabalpur Line. This park is very well connected to Nagpur and Jabalpur by means of National Highway No – 7. Nagpur will be closest, around 92 km from the Park. The road route which takes two hour drive from Nagpur to reach here. 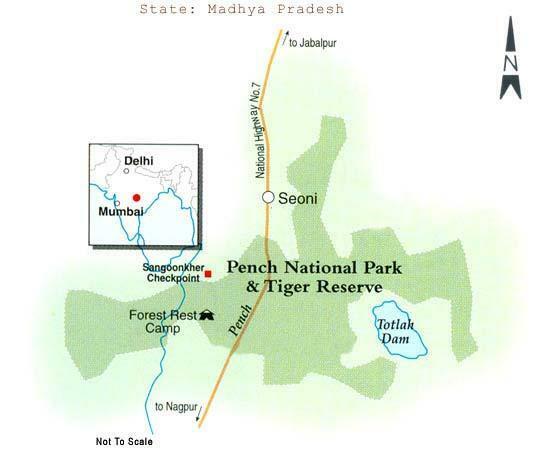 The route is Nagpur – Kamptee – Kanhan – Mansar – Khawasa – Turia – Pench. The road route from Jabalpur is a 4.5 hours journey would be through the National Highway No.7 from Jabalpur – Dhuma – Seoni – Gopalgiri – Pench. Mahatma Gandhi Circle (Bangalore) – NH7 (follow the Queen's Road) – Palace Road – Chowdiah Road – Yelahanka Bypass – NH7 – Jawaharlal Nehru Expressway – Gachbowli Miyapur Road – Bollaram X Road – 1st Exit to NH7 – Turn left at State Highway 243 – Nagpur – Kamptee – Kanhan – Mansar – Khawasa– Turia – Pench National Park.